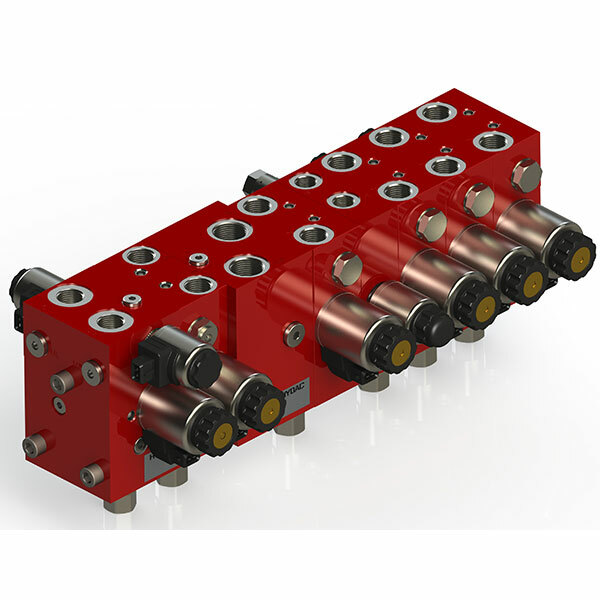 HYDAC presents the modular manifold system for the working hydraulics in mobile machines. Machine development times at the producers of mobile working machines are shortening more and more. The same thing happens between project start and production start times. Here the manifold system is at optimal development tool. Indeed, the machine producer defines a basic machine (Standard), which enlarges with possible options. Exactly according to this schematic, it will chose a basic manifold system and define optional modules. A short delivery time and the flexibility are securing a fast and successful project start. Indeed, it allows integrating options in an easy way at every time of the process. The performance range is depending on the module 0-80(100) l/min. This is an adjustment to the complex and flexible demands of the mobile hydraulics (e.g. municipal-, agricultural- and construction machines). Therefore, the system base is on the existing valve technology of HYDAC. We incorporate the special demands of the mobile branch: compact, enlargeable, weight-optimised and service-friendly. Furthermore, the competitive advantages of this product are its application competence and the reaction promptness. Indeed, their transfer is by the system to the producers of working machines and their hydraulics.